Along one wall and spanning a corner of her studio, Birte Bosse stages small-scale exhibitions in order to visualize interactions between works, in the space and with the wall. As she walks me through it, she points out a small potted tree that also engages in this exchange. Bosse is interested in observing the way its organic forms interact with the smooth linearity of surrounding works, which—though precisely articulated in shiny metals and dark ink—convey their own sense of organic spontaneity, flowing movement and transformation. The works displayed are mostly small-scale and imbued with an element of lightness. Affixed to the wall, suspended in space and freestanding, her ‘space drawings’ alternately emerge and drift into the white backdrop of the wall, their subtle shadows and reflective surfaces providing a hint of depth. 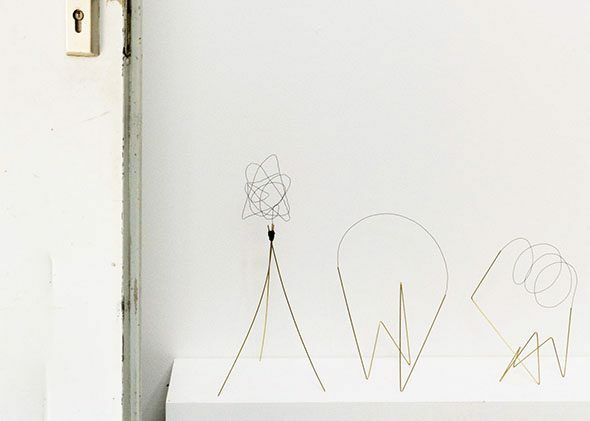 These sculptures, formed with black wire and gold metal tubing, are juxtaposed with abstract ink drawings in varying degrees of detail and intricacy: as impetus for, in tandem with and a by-product of the space drawings. Groups of works on paper and clusters of sculptures seem to indicate different stages of development and working processes. However, Bosse reveals that the earliest of the space drawings were produced within the last month. They are all recent works, and she is currently engaged in experimentation with various methods and materials simultaneously. The space is a laboratory for experiments, and one floor-based sculpture even incorporates glass test tubes, which reinforces this association. Similarly, a larger, freestanding space drawing features a hanging loop of clear plastic tubing filled with liquid. 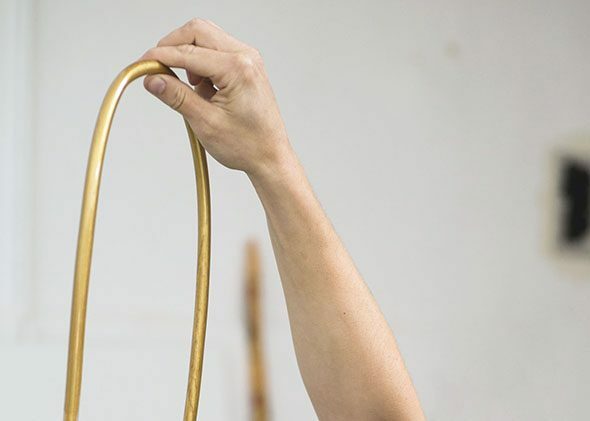 A section of gold tubing at the bottommost portion of the curve initially seems to be of the same gold metal used in adjacent works suspended from the ceiling and attached to the wall. 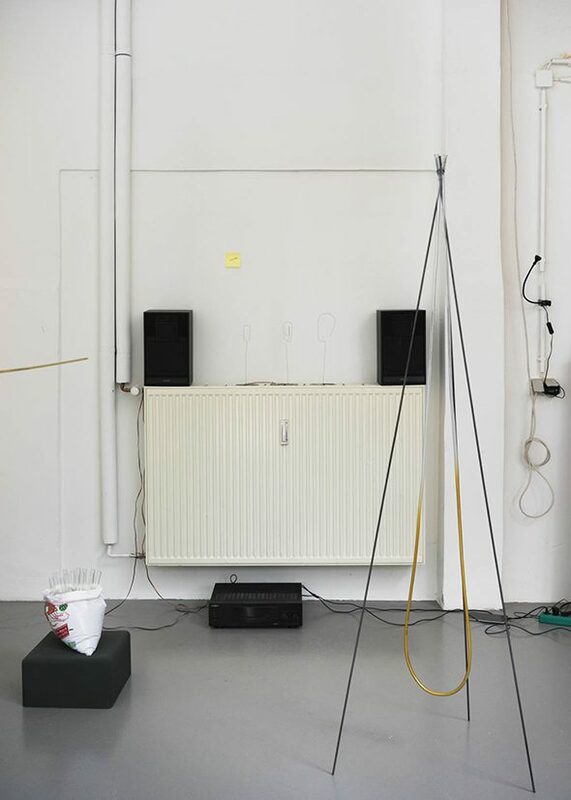 However, Bosse demonstrates the particular aspect she is currently exploring in this work by lifting the plastic tube so that the loop is inverted. Slowly, the gold strip loosens up and its particles begin to fall gently down the inside of the tube. The transparent liquid that fills the tube is part of the gold ink, which has separated from the pigment by remaining static. Once lifted, the ink is set in motion, expanding its trail through the tube and painting a line in space. The longer it rests, the longer it takes to disperse and reintegrate, adding a time-based element to the sculpture. 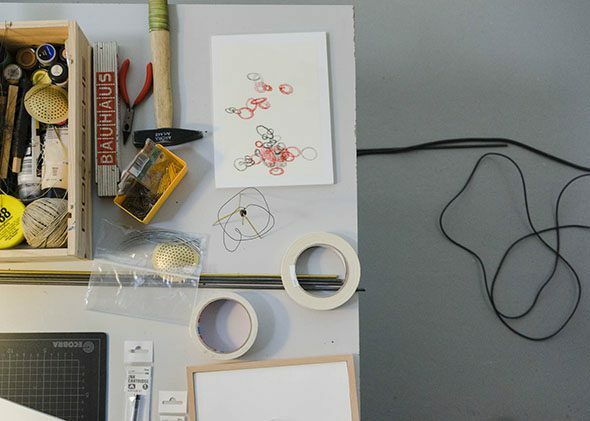 Though working with liquid in this way is new for Bosse, a connection emerges between the liquidity and slow movement of this work and that of a video that was recently shown during a Performing Encounters salon event at Haus am Lützowplatz. Bosse tells me about the work, in which she filmed the paddle of her row boat while remaining stationary in a lake. The stillness of the water gets interrupted by a passing boat, and its waves resonate over the surface and activate the motion of the paddle. The paddle in turn draws lines on the surface of the water as it dips in and out, wielded by the movement of the waves. The water functions as both a surface for drawing and a substance with which to produce drawings, like ink, and, for Bosse, presents the first opportunity to film a drawing as it emerges on a surface. When working with time-based media such as video, however, Bosse explains that she still approaches it as a static work. This aspect comes through in the video, which moves so slowly and subtly as to appear like an actual drawing. Bosse initiated another use of natural material as an element of drawing in the salon installation. Black soil covered the floor of the exhibition space, surrounding the pedestals on which her smaller space drawings were placed. For Bosse, the soil held multiple references: as a mainstay of her childhood in the countryside, walking on the lawn and soil with bare feet; as well as in its rich, dark tone, an inky black reminiscent of that in her drawings. A more spontaneous third element came into play on the night of the salon: as the space was traversed, traces and footprints were left behind, and drawings manifested on the soil’s surface. A similar process of leaving temporary impressions informs the glass test tube sculpture. Placed in a bag of sand on a low-standing pedestal, the test tubes poke holes through the surface, offering a view down into its dark depths. The structure may at first appear solid and stable—as though the tubes have been set in concrete—but it can shift at any moment. The glass tubes can be removed and placed in another spot, as the indentations they leave behind slowly close back up, once again engaging time, slow progressions and subtle movements. 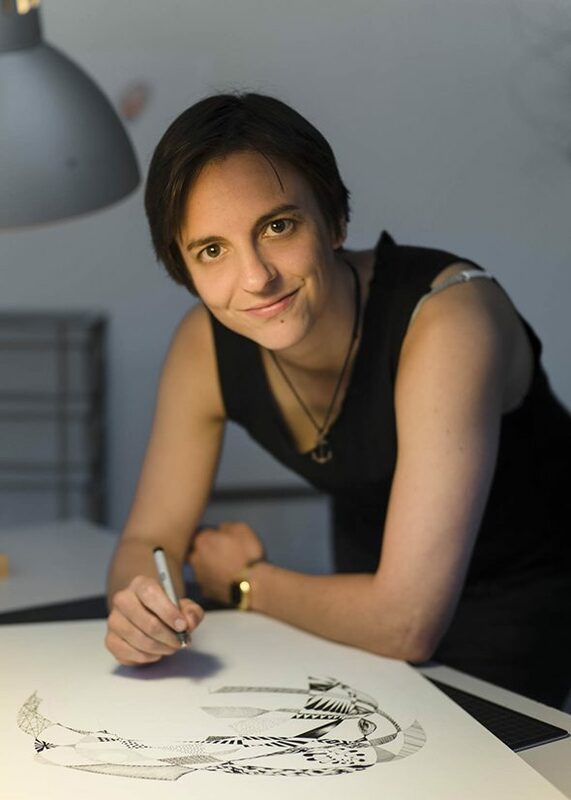 As she shows me a book of some of her earlier drawings—drawings that are more figurative and narrative in nature, but in which a sculptural quality can be perceived in the specific use of form and line—she talks about observing her surroundings and noticing the small details of things. This is also expressed through her fondness for being immersed in nature. Having grown up in the countryside, she feels at home in its quiet, as a place to think, observe and let forms and connections emerge slowly. This is a sentiment that surfaces in her work. In the use of materials like sand, ink and water, slow progressions and subtle motions indicate an unfolding of time, ephemeral traces and shifting impressions. In thinking about and through the line, its constant ebb and flow and various intersections coalesce to materialize the state of being in process.